The American cockroach has reddish-brown wings with light markings on thorax. It’s also commonly known as the water bug, flying water bug or palmetto bug. These large cockroaches can grow to exceed 2 inches in length. Like all cockroaches, it is omnivorous and will eat virtually anything people will and many things we won't. Also, it has shown a marked attraction to alcoholic beverages, especially beer. Unlike other cockroach species, American cockroaches are good flyers. 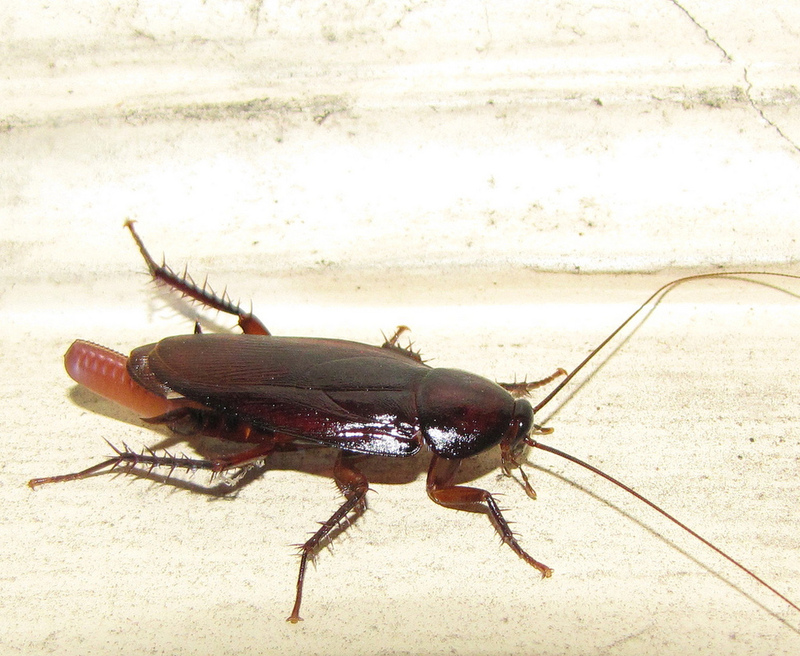 This cockroach thrives in warm, damp environments, such as sewers, steam tunnels, basements, crawl spaces, and boiler rooms. When an American cockroach population infests a human home, the insects are drawn to food storage and preparation areas, as well as moist locations. They also gather together in open spaces, while other domestic cockroaches tend to hide in cracks and crevices. The German cockroach is much smaller than the American, only 1/2 inch to 1 inch in length. It is light to medium brown with two dark longitudinal streaks on the thorax. The German cockroach is the most prolific breeder among all cockroaches. Each egg capsule can contain up to 40 eggs and development from egg to adult can occur in as little as 45 days. Because of this, extremely heavy infestations are not uncommon. It is primarily nocturnal and generally infests areas close to food, moisture and warmth. 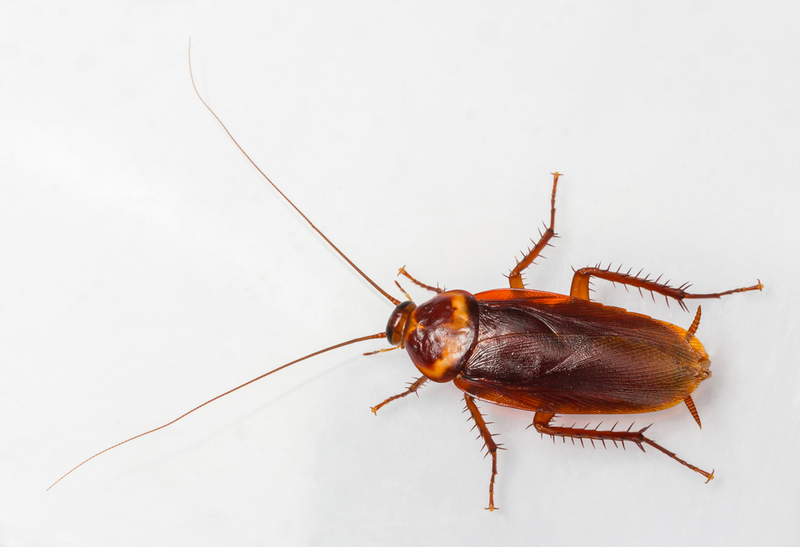 Also, it is the most common cockroach found in and around apartments, homes, supermarkets and restaurants. The female is all black, while the male has two brown wings, both are about 1 inch long. It is more sluggish than other species, and gives off a distinctly unpleasant odor. During the summer, oriental cockroaches move outdoors where they may venture into neighboring buildings. During the colder months, they reinvade homes, establishing themselves in basements and crawl spaces. This cockroach commonly inhabits sewers and storm culverts and will enter buildings through floor drains. It has also been known to live outdoors in firewood, leaf litter, sheds, dog houses, and similar locations. Indoors, the basement, crawl space, and occasionally the attic will be the primary harborage for this pest. They are uniform brownish black to mahogany in color and early nymphs have a white stripe on back. It enters structures at night through cracks and crevices, but tends to live in natural conditions around structures. Also, it is often associated with debris filled gutters. It is commonly attracted to homes to feed on improperly maintained trash containers and pet food on patios and decks. The smoky brown cockroach usually invades the attic or crawl space where it finds conditions similar to those found within a tree hole. Once populations grow large inside these areas, the cockroaches regularly venture down into the home. The smoky brown prefers damp areas because they lose moisture more readily than other cockroaches.